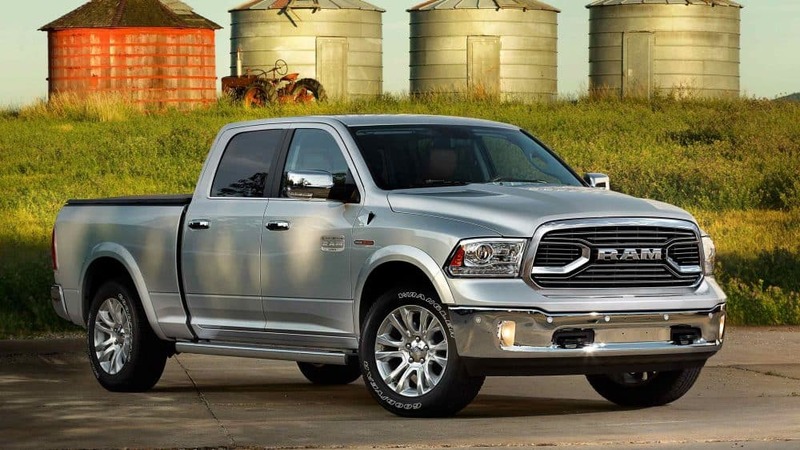 Ram has taken their beloved 1500 model and cranked the dial up to 10 for the 2019 model! There are so many things to love about this truck from the enhanced suspension that provides a luxurious sedan-like ride to the incredibly quiet and well-equipped cabin. Not to mention the off-roading Rebel variant that will impress even the most experienced off-roaders! New changes for the 2019 model year include the addition of a mild-hybrid power system, increased rear passenger room, and improved towing and payload capacity. Want to learn more about the full redesigned 2019 Ram 1500 and everything that it has to offer? Read the rest of our complete review below! Is there more than one powertrain option for the new 1500? There are two engine options for the 2019 Ram 1500. The first, the trusty 3.6-liter Pentastar V6, outputs 269 lb-ft of torque and 305 hp. This engine comes mated to an automatic eight-speed TorqueFlite transmission and is equipped with a mild-hybrid system that helps boost both performance and fuel economy. This engine boasts the best-in-class standard V6 horsepower! The second engine option is a 5.7-liter Hemi V8. This is available with or without the mild-hybrid system and both versions come mated to the same eight-speed transmission as the V6. The EPA estimates that this engine can get up to 22 mpg on the highway and 15 mpg in town with 2WD. When equipped with the mild-hybrid system this V8 engine boasts the best-in-class V8 towing maxing out at 12,750 pounds! Both engines can be equipped with eight 2-wheel or 4-wheel drive configurations. What trim levels are offered for the all-new 2019 Ram 1500? Ram is offering the 1500 is six trim levels for the 2019 model year, each of which has its very own theme. These trim levels include the Tradesman, HFE, Big Horn, Rebel, Laramie, Longhorn, Limited. Standard features include a 5-inch touchscreen, automatic headlights, a locking tailgate, a rearview camera, Bluetooth and more! The HFE is similar to the Tradesman but offers standard rear-wheel drive. Next up, the Big Horn model, adds features like 20-inch wheels, dual-zone climate control, side steps, and an 8.4-inch touchscreen with Apple CarPlay and Android Auto. The Rebel model takes the off-roading crown by adding features like front tow hooks, fortified shocks and suspension, all-terrain tires, and skid plates. The Laramie trim gains more luxurious features like leather upholstery, front and rear parking sensors, power-adjustable pedals with memory settings, and keyless entry. The top-of-the-line Longhorn gains even more features. Like a navigation system, chrome side steps, automatic high beams, a power liftgate release, heated and ventilated rear seats that can also recline, and a leather-wrapped wood steering wheel! Dos the all-new 1500 offer safety features? Ram didn't stop there! The 1500 also benefits from improved safety and security features for the 2019 model year. This truck offers over 100 passive and active features and equipment giving drivers an extra boost of confidence no matter what the road ahead looks like. Standard safety equipment includes child safety seat anchors, electronic roll mitigation, an advanced airbag system, hill start assist, a theft protection system, traction control, remote keyless entry with All-Secure, electronic stability control, and front height adjustable shoulder belts. Available features include hill descent control, full-speed forward collision warning plus, a security alarm, and more! The 2019 Ram 1500 is a mighty machine offering a model to accomplish every job! Come on down to the dealership today to check this truck out in person and even take one out for a test drive. We know that you'll love this truck!